Israeli Druze say they are on alert after Al Qaeda massacre, 'will not hesitate' to cross border and protect relatives if necessary. 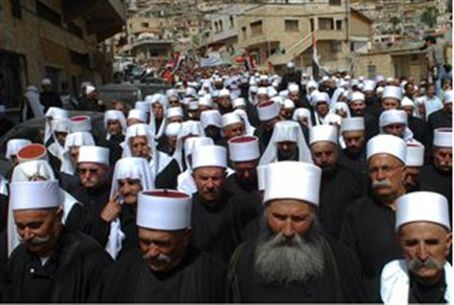 The Druze community in Israel is on high alert Sunday, after Al Qaeda massacred 20 Druze in Syria - a move the community has deemed a "red line." "Israel's policy is that it will not intervene in Syria, and we accept that with understanding and love," former minister Salah Tarif, who served in the 12-16th Knessets as part of Labor, stated to Walla! News. "We will also not interfere, but we do have red lines." "We are operating now as a form of witness, as a religious entity to protect our brothers," he added. "We are 'at the ready' like a Tzav 8 (reserve call-up in the IDF during an emergency - ed. ), so that if there is something that will require our intervention, we will not hesitate to do it." Tarif noted that a lot of Israeli Druze have immediate family on the Syrian side of the border, and that they were willing to cross into Syria to protect their relatives - and specifically "women and children" - "without hesitation." "It happened during the civil war in Lebanon, when there were clashes between Druze and Maronites - and here it may occur with greater intensity," he added. The most threatened area for the Druze is now Jabal al-Arab, a mountainous region in southern Syria where five Druze were killed in clashes with Islamic State (ISIS) earlier this month. Druze leaders argue that their friends across the border have no means of self-protection after Assad's army moved into the area. Last week, Druze leaders asked US Ambassador to Israel Dan Shapiro for help in combatting the threat, asking for military aid and airstrikes to prevent ISIS from getting too close to their communities and religious centers.